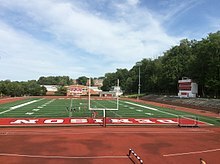 Denison University is a private, coeducational, and residential four-year liberal arts college in Granville, Ohio, about 30 mi (48 km) east of Columbus. Founded in 1831, it is Ohio's second-oldest liberal arts college. Denison is a member of the Five Colleges of Ohio and the Great Lakes Colleges Association, and competes in the North Coast Athletic Conference. The acceptance rate for the class of 2023 was 29 percent. In 2016, the college added three new majors: data analytics, global commerce, and health, exercise, and sport studies. In a The Huffington Post piece, president Adam Weinberg argued that the study of big data may not be unique for post-secondary education, but the marriage of liberal arts and data analytics is a unique concept. "In short," he writes. "a liberal arts background gives data analytics its soul." The interdisciplinary major combines courses in mathematics and computer science, electives from the social and natural sciences and four new courses in data analytics. These courses allow students to acquire a foundation, learn the technique, apply the technique across disciplines, and pull it all together. According to Weinberg, this foundation will help students frame questions appropriately, work in interdisciplinary teams, communicate results effectively, and make ethical decisions. As reported by The Newark Advocate, graduates from this major may work in fields like marketing, product development, public health and other vocations. The global commerce major is the result of an 18-month research process, which included interviews with many employers and graduates. In another article in The Huffington Post, Weinberg describes the process — "Over and over again, we heard a desire ... for a new kind of academic program that would give students an understanding of how economics, accounting and commerce work, blended with a wide range of liberal arts courses that prepare students to think, read cultures, understand historical patterns, problem-solve and communicate clearly. And the value of multiple internships, externships and opportunities to study abroad was stressed." The global commerce major was created to meet these requirements. The course of study has five main components: the commerce core to develop a sound understanding of economics; a specific global focus or geographic region of study; language proficiency related to their area of interest; off-campus study related to the major; and a senior capstone. The goal of this major is to produce graduates ready and capable to enter the global workforce with analytical skills and an understanding of how economy and trade are connected to culture, social movements and other global factors. For the Class of 2022, Denison received over 8000 applications and accepted 34%. The Vail Series began in 1979 as the result of a financial gift from Mary and Foster McGaw in honor of Jeanne Vail, class of 1946. Michael Morris, who previously worked as the executive director of the Midland Theatre, Newark, Ohio, was appointed to be the director of the program in 2014. According to an article by the Newark Advocate, The Vail Series is an "acclaimed visiting artist program" where artists are encouraged to both perform and interact with students. As Morris said in the article, "Our visiting artists always comment on how engaged the students and faculty are, how warmly they are welcomed, and how beautiful the setting is. They develop relationships here." Tickets to the Vail Series are free to students. Former performers include Itzhak Perlman, Yo Yo Ma, Renée Fleming, Wynton Marsalis, Jessye Norman, and Chris Thile and Edgar Meyer among others. In 2014, the university announced that ETHEL will become their first ensemble-in-residence. They performed their multimedia concert "Documerica" on campus during the spring of 2016 and will receive honorary degrees from the college at the commencement ceremony in 2017. In 2016, Denison celebrated their 12th annual Bluegrass Festival. This weekend-long celebration includes multiple concerts, instrument workshops, and jam sessions. All of the events held at Denison during this festival are free and open to the public. "You can't beat the price," said then-Chair of the Music Department Andy Carlson to the Newark Advocate. "I'm really proud of Denison for continuing to support this." Outside of the classroom and annual festival, there are many student-led initiatives in the arts at Dension. The Denison Independent Theatre Association (DITA) offers opportunities for non-theatre majors to act in shows, often written and directed by students themselves. Films are shown weekly by the Denison Film Society (DFS). Burpee's Seedy Theatrical Company is the oldest collegiate improv group in the nation. It was founded in 1979 and the group's most famous alum is actor Steve Carrell. There is also a variety of student music ensembles, such as Bluegrass, Blues, and Jazz Ensembles, Gospel Choir, and a cappella groups. There are four a cappella groups on campus: The Denison Hilltoppers, DUwop, Ladies Night Out, and Tehillah. In the spring of 2014, the Denison men's tennis team, following a strong season, finished the season ranked 28th in the ITA Division 3 May 1 rankings. The ranking, backed by impressive victories over North Carolina Wesleyan College and Trinity College among others, was the best finish for the Big Red squad since 2011. Critical praise from the media was received along the way, with division3tennis.com stating, "The usual Denison formula of great doubles and depth is back." The Denison University Squash Team has spent the majority of its time as the #1 club team in the nation and competes with some of the top varsity teams across the nation. With money from this grant, the college has doubled the staff in the career office and created a new program to aid students and recent graduates called [email protected] In an article published by The Huffington Post, Denison President Adam Weinberg describes [email protected] as a program that addresses four major observations about higher education career preparation: colleges need to offer an array of professional development programs that cater to students' individual interests; colleges need to utilize the 40 percent of the calendar year when students are not in class to focus on their career exploration and they should support these activities financially; colleges should leverage their strong network of alumni and parents; and colleges must create a shift in campus culture that encourages early engagement with the career center. As reported by Columbus Business First, [email protected] aims to help recent graduates as well. According to President Weinberg, this can happen through networking events where you can meet people in your own field and build community. ^ "Denison Admission Most Selective in College History". Denison University. Retrieved 2018-03-27. ^ a b "Message from John Faraci, Chair of the Board of Trustees on Monomoy Place and 131 West Broadway". Denison University. Retrieved 2018-08-03. ^ "Columbus Region | Rankings & Accolades". Columbus 2020. Retrieved 2017-11-10. ^ "The Best Places to Live in America Right Now". Money. Retrieved 2017-11-10. ^ University, Denison. "Fast Facts". Denison University. Retrieved 2017-11-10. ^ "Denison to offer full-tuition scholarships to 20 Columbus schools grads each year". The Columbus Dispatch. Retrieved 2016-11-02. ^ University, Denison. "Denison's New Major in Data Analytics". Denison University. Retrieved 2017-11-10. ^ University, Denison. "A New Major: Global Commerce". Denison University. Retrieved 2017-11-10. ^ University, Denison. "New Major in Health, Exercise, and Sport Studies | Featured News | Denison University". Denison University. Archived from the original on November 10, 2017. Retrieved November 10, 2017. ^ a b c Weinberg, Adam (2016-04-19). "Data Analytics and the Liberal Arts | Huffington Post". The Huffington Post. Retrieved 2016-11-02. ^ a b "Denison starting data analytics major". The Newark Advocate. Retrieved 2016-11-02. ^ a b c Weinberg, Adam (2016-01-14). "Beyond Business: Global Commerce and the Liberal Arts | Huffington Post". The Huffington Post. Retrieved 2016-11-02. ^ "Denison offering new global commerce major". The Newark Advocate. Retrieved 2016-11-02. ^ University, Denison. "Overview". Denison University. Retrieved 2017-11-10. ^ University, Denison. "DCA". Denison University. Retrieved 2017-11-10. ^ University, Denison. "Fraternities & Sororities". Denison University. Retrieved 2017-11-10. ^ University, Denison. "Campus Series". Denison University. Retrieved 2016-09-09. ^ a b University, Denison. "Vail Series". Denison University. Retrieved 2016-09-09. ^ a b c "Denison taps Morris as Vail Series director". Retrieved 2016-09-09. ^ University, Denison. "Gabriel Alegría and the Afro-Peruvian Sextet | Oct 6, 2016 7:00pm". denison.edu. Retrieved 2016-09-09. ^ a b University, Denison. "Beck Series". Denison University. Retrieved 2016-09-09. ^ "Denison Bluegrass Festival celebrates 12th year". Retrieved 2016-09-09. ^ a b "Bluegrass festival kicks off 11th year Saturday". Retrieved 2016-09-09. ^ University, Denison. "Art Space in Newark". Denison University. Retrieved 2017-11-10. ^ WSYX/WTTE. "Denison mens swimming and diving takes fourth national title, school's 100th championship". WSYX. Retrieved 2018-03-27. ^ May 1st ITA Division 3 Men's Tennis National Rankings Archived May 7, 2014, at the Wayback Machine. "Intercollegiate Tennis Association." Retrieved May 6, 2014. ^ Denison Men's Tennis 2014 Schedule. "Denison University Sports Information." Retrieved May 6, 2014. ^ D3CentralTennis (March 26, 2014). "State of the Region Address: Central". division3tennis.com. Retrieved May 7, 2014. ^ a b "Denison gets $9.3 million gift to endow career programs". The Newark Advocate. Retrieved 2016-10-07. ^ a b Weinberg, Adam; University, Denison (2016-09-08). "Rethinking the Career Service Center". The Huffington Post. Retrieved 2016-10-07. ^ a b Buchanan, Doug (April 18, 2016). "Denison University lands $9.3M gift from Knowlton Foundation for [email protected] effort and career center". Columbus Business First. Retrieved 2016-10-07. ^ Weinberg, Adam; University, Denison (2015-10-15). "Ready, Set, Go Build a Life: Preparing Students for the World of Work | Huffington Post". The Huffington Post. Retrieved 2016-10-07. ^ "Dialed In: James L. Anderson of Turner Broadcasting on Arts and Entertainment". PRSA. Retrieved 2017-01-13. ^ "People". Bloomberg.com. Retrieved 2017-01-13. ^ "The Rev. Dr. Kelly Brown Douglas - Washington National Cathedral". Washington National Cathedral. Retrieved 2017-01-13. ^ "The Deep Roots of American Racism". Denison Magazine. Retrieved 2017-01-13.